Greetings and love, Club members! Today is Sunday, which for many of you means a day of rest, meditation, worship, reflection, or even the last day of the week you can get away with having a drink during the day…don’t judge me. For me, this Sunday is not just a day of rest, it’s also the day before I start Les Mills COMBAT, a 60-day home fitness program designed by world-renowned fitness company Les Mills (specifically Dan Cohen and Rachael Newsham) and Beachbody, who have developed P90X, INSANITY, TurboFire, etc. Based on the Les Mills BODYCOMBAT program taught in gyms, this DVD version of it utilizes mixed martial arts-based moves in its cardio routines such as karate, tae kwan do, kung fu, capoiera, muay thai, boxing, etc. with some strength, plyometric, stretch, and core routines thrown in as well. This also begins the next 60 days of dedication to clean eating. I plan to have a treat occasionally if I feel I’ve reached my weekly or biweekly goals, but I want the best results possible and they can only be achieved if I stick to a healthy nutrition plan! After previewing the workouts, I have to say I am really, really excited to begin this new chapter of my fitness journey. I own INSANITY and I love it a lot, but I’ve been starting and stopping it quite a bit, and I admit I’ve grown slightly bored with it lately. Les Mills COMBAT is nothing like it. After trying out Combat 30 and 45, I found myself shocked by how in control I was throughout the routine. INSANITY absolutely annihilates me every time I do it, which is both empowering and frustrating. COMBAT works the hell out of my body, especially my upper back, but I always felt like I’m in control, even as the sweat’s flying off me and I feel fatigue starting to set in. The punches, kicks, jumps, blocks, flows, everything just gives me a unique sense of order and power, and I cannot wait to see what kind of results it’s going to provide. Additionally, I own Les Mills PUMP, the company’s high rep low weight barbell program, which gave me a lot of strength, particularly in my legs thanks to the insane amount of squats and lunges they made me do. After I complete a round of COMBAT to focus solely on weight loss, I’m going to do a PUMP-COMBAT hybrid, which is perfect since PUMP has days set aside for cardio in its calendar. Starting tomorrow, I’m going to be giving a daily journal of my workouts and everything I eat, good and bad, to not only keep myself accountable to my followers and readers, but to also show what realistic dedication to a workout regimen is like. If you have any questions or want to join me doing COMBAT or any other routine to kickstart your fitness, comment below. There’s always room for new members of The Nonathletic Club. Here is a quick rundown of the workouts, specifically those in the Ultimate Warrior package. The Basics – An instructional DVD teaching how to perform the various martial arts moves used in COMBAT. I highly recommend watching this if you have questionable form or coordination, like I do. Combat 30: Kick Start – A 30-minute MMA cardio routine, pretty self-explanatory. Combat 45: Power Kata – A 45-minute MMA cardio routine, focusing more upon specific kata (型, or “form”). Combat 60: Extreme Cardio Fighter – Not much to say except it’s 60…actually, more like 53 minutes of intense MMA cardio. Combat 60 Live: Ultimate Warrior’s Workout – A variation of Combat 60 filmed live in Bristol, UK to add routine to the regimen. Combat 30 Live – A slightly different choreographed half-hour routine also filmed live in Bristol. I got it for free ordering through Team Beachbody. It’s nothing super necessary but it looks like a fun alternative to Combat 30 if you want to switch things up. HIIT 1: Power – Because man cannot live on punches and kicks alone, they’ve also included two high intensity interval training (HIIT) workouts, and this one is a higher rep lower weight resistance routine, so you’re going to need a pair of dumbbells or a barbell. HIIT 2: Shock Plyo – A high impact plyometric routine involving minor use of weights. Warrior 1: Upper Body Blow Out – An upper body routine utilizing pushups, renegade rows, presses, etc. to really hone in on chest and back strength. Warrior 2: Lower Body Lean Out – A pretty high paced leg routine in the same vein as HIIT 2: Shock Plyo but different enough to add variety to your schedule. Inner Warrior Stretch & Strength – COMBAT’s signature stretch routine to restore strength and power so you can kick @$$ the next day. Core Attack – A 16 minute ab workout; nothing too fancy, although you’re going to need a dumbbell, kettle bell, or weighted plate for one of the routines. 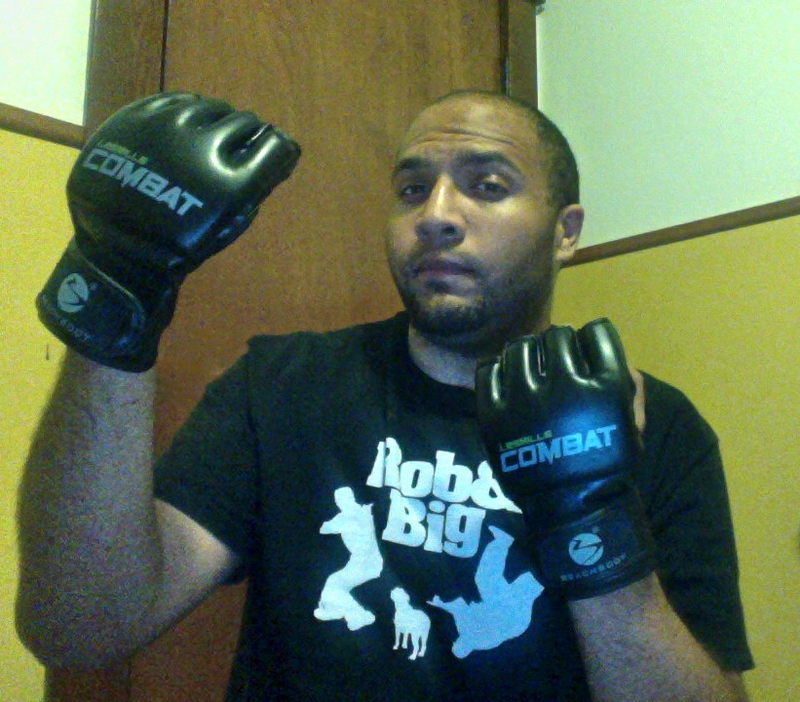 Les Mills COMBAT training gloves (see Fig. 1 below)- They say these help you punch better. I don’t know how objectively true that is, but I will say I feel more powerful wearing them and I feel a sense of aerodynamic motion in my punches. Plus they look freaking awesome. Like most other Beachbody programs, you also get an instructional guide and a nutrition guide. My order was initially messed up so they’re being shipped to my house now, and I’ll give you my thoughts on them once they arrive. Fig. 1 (above): Staying with the fight, or something to that effect.